View More In Ironing Board Covers. AlumiTek Pro by Tivit is the ultimate in textile technology for scorch resistance & heat-retention. It is constructed of 3 layers, engineered for optimum & efficient ironing performance. It's the perfect cover for high-volume ironing or steaming. AlumiTek Pro technology allows for the iron to glide smoothly while reflecting heat, providing efficiency in ironing time and better results. Our AlumiTek Pro ironing board covers obtain heat-retention properties unmatched & perform at a higher level then the basic silicone coated fabrics. ? ?Our ironing board covers attain the highest quality in the industry, with European workmanship & attention to detail. All of our covers are one-piece construction allowing for Crease-Free ironing surface. The technology & engineering of our various textile treatments have been carefully designed to suit the different types of ironing, pressing or steaming required. We are referred to as the pioneers in the industry for our unique approach to engineering textiles. Choosing the right cover for your ironing board makes all the difference when it comes to garment-care! 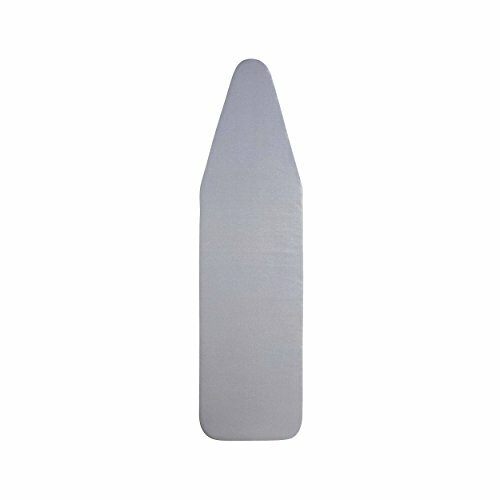 There is no other component that plays a bigger role than the Ironing board surface itself. The efficiency of the process & the results are based on the type of technology & construction of the cover. Quality, durability & performance of our products is what makes our covers stand out. Our products are individually crafted & our quality control is unmatched. Therefore, you may purchase with confidence, as we stand behind our products & your satisfaction is guaranteed. 2 Velcro Straps are sewn to strap the cover from under the board for optimal & secure adjustable fit. The straps are placed carefully not to interfere with the movement of your board. 3 layer, one-piece construction with Crease-Free fit - Top AlumiTek layer, Foam inner middle layer, & thick felt padding all adhered together as one piece! AlumiTek Pro Silicone Coated, providing superior ironing experience, smooth-glide surface, Stain resistant & Easy Glide Ironing! Exceptional Heat-Retention & Heat-Reflection Performance! Textile is treated & cover is manufactured in Europe! This product comes with a 2 YEAR WARRANTY! If you have any questions about this product by TIVIT, contact us by completing and submitting the form below. If you are looking for a specif part number, please include it with your message.